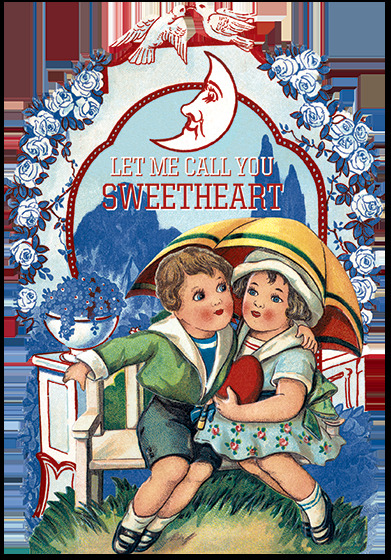 Let Me Call You Sweetheart is a book-length valentine using the words of the beloved 1910 song as the text. It is illustrated on every page with a beautiful vintage valentine from the Laughing Elephant's vast treasure trove. Let Me Call You Sweetheart is die cut, like an over sized Valentine's day card, and is in the same format as the Laughing Elephant's popular line of die cut, shaped, books. Crafted to look like a lovingly filled out scrap book, with Victorian scraps, Valentines and the sweet words of the song hand written in old fashioned cursive, it also features an elaborate border area for personal inscription. Let Me Call You Sweetheart will make a stunning Valentine's Day gift for those times when a card just isn't sufficient.